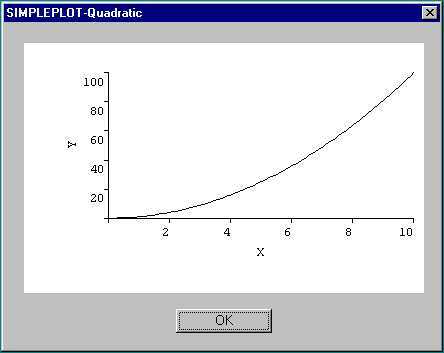 In our first example we create a window and draw a quadratic curve within it. c--Create the data to be plotted. width and height represent the pixel dimensions of a SIMPLEPLOT graphics region within the window. Some of the options take additional arguments. In this example, the option called x_array takes three arguments namely the number of points N followed by an array of x co-ordinates and an array of y co-ordinates. Following the usual ClearWin+ convention, all real data is passed as DOUBLE PRECISION values. However, SIMPLEPLOT uses single precision, so data values should not exceed the single precision range.